Current Kumul centre Katto Otio aged 23 passed away in Port Moresby in the early hours of Tuesday morning. Ottio was Kumul No. 269 and played in seven Tests with the last game in the 2017 World Cup quarter finals against England in Melbourne on November 19, 2017. “His death has shocked us all,” Tsaka said. “We thank the “Kumul Warrior” for services to rugby league. 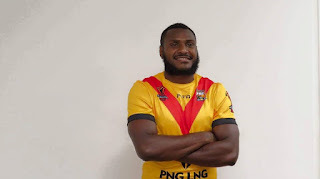 Meanwhile the funeral service for late Kato Ottio will be held on Friday January 12 at 10am at the Sioni Kami Memorial Church at 5 Mile in Port Moresby. Chairman Tsaka said that a post mortem will be carried out on late Kato Ottio tonight. “The family agreed for a post mortem to be done on late Kato to determine the cause of death,” Tsaka said. Kato Ottio will be buried at the 9mile cemetery outside Port Moresby later in the afternoon on Friday.